The recent killings of young people on the streets of London is heart wrenching for the families and communities affected. It was two years ago that from my ninth-floor flat window in East London I watched a 17-year-old boy die from multiple knife wounds as paramedics tried, for half hour, to keep him alive. The sadness and pain felt amongst the whole of the community that followed this boy’s death ran deep and soon turned into anger and despair. Press coverage has not shed much light as to why this recent spate of killings have taken place. It was the New Labour government under Blair that introduced the soundbite ‘Tough on crime and tough on the causes of crime’. In reality it was only the first part of this soundbite that was ever implemented. A climate of fear was created leading to more young people imprisoned and Anti-Social Behaviour Orders (ASBOs) were the means by which a generation of young people were criminalised. The New Labour government introduced over 700 new offences aimed at curbing young people’s behaviour. Stop and search increased targeting young people from BME backgrounds which meant that you were seven times more likely to be stopped and searched if you were black than if you were white. Today, once again, we are offered up the same platitudes and fear-mongering as in the past -feral youth stalking our cities, police losing control of our streets and calls for a return to an increase in stop and search. If we are to deal with the issues of gang related crime we must deal with the source of the problem by being ‘tough on the causes of crime’. The new GCSE English language syllabus includes answering questions on 19th century non-fiction texts. To help students prepare for this question I decided to offer my students a choice of four titles of discursive essays looking at 19th century life which helped to contextualise this period of history. Two young people at my college in North London have lost their lives over the last two years to gang related violence so it was not a surprise that many of them chose the essay title, ‘Gangs why they have always existed’. The task of the essay was to research gangs of the 19th century and look at the comparisons with today. They researched articles from newspapers from the 19th century about gang related crimes. They were all taken back about how similar not only the crimes were but also the way the press reported them. The same press hysteria and demonisation of the young. 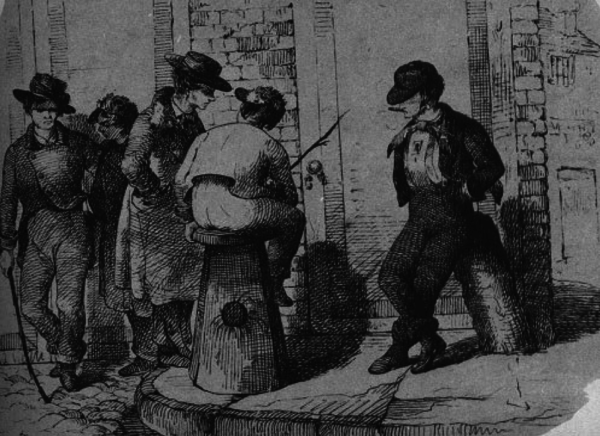 Gangs have always been a part of modern industrial society. The industrial revolution of this period saw a transformation in the way people lived their lives. Forced from the countryside to live in sprawling industrial centres in Manchester, Birmingham and Liverpool people lived and worked in appalling conditions. Wars and poverty across Europe also led to waves of migrant workers seeking a better life only to find poverty, squalor and racism. It was in this context that gangs rose in all of the major cities in Britain. In Manchester a gang known as the Scuttlers were notorious for mass street brawls and running protection rackets around the music halls. In Liverpool a gang called the High Rip Gang were notorious for violent muggings in the dockland areas of Liverpool. The Peaky Blinders, dramatized by the BBC series of the same name, operated in the industrialised areas of Bordesley and Small Heath, when the city was one of the world’s most important manufacturing hubs and earned their name through the practice of sewing razor blades into the peaks of their flat caps. The Forty Elephants were an all-female crime gang who were based in the Elephant and Castle area of London specialising in shoplifting and smash and grab raids led by a woman called Diamond Annie. The common themes that all these gangs shared were that they attracted the young, they were poor and they sprang out of the most terrible human suffering. For many of my students these themes were not historical ones but ones that existed today. They describe in their essays the fear that young people feel about the future and the pressure on them to achieve at any cost. The ‘get rich quick or die trying’ ethos of the 19th century is all pervasive in today’s consumer society. But they live in a society which cannot provide meaningful employment for them or any employment at all. Where education is increasingly narrowed down to a set of functional skills and ‘employability’ and they are vilified in the press as feral. In short, a society that likes to blame the people who are least responsible for the wars, poverty and general lack of opportunities rather than dealing with the systemic consequences of an unplanned and deregulated society. It is not surprising that in this situation, a small minority of young people faced with their path being blocked to a better life look instead to desperate ways of achieving a more secure future for themselves. The need to have power is often attributed, by many commentators, as the main driver as to why young people join gangs and carry out violent crimes. This misunderstands the motivation behind such acts. It is not power that motivates working class people to carry out horrific acts against each other, it is the lack of power. Being prepared to die for a post code is not a sign of young people being all powerful – it is a reflection of the lack of power they have over their own lives. A powerlessness which leads to an attempt to rest some control over the direction of their lives. Of course, gang life doesn’t give young people control. It leads to imprisonment and for too many deaths at the hands of another young person who too is desperately seeking to establish some measure of meaning to their lives. The era of austerity has made the conditions of the young working class even more intolerable. The Equality and Human Rights Commission reported that those under 34 had suffered the biggest drop in income and employment since 2010. Young people under 34 have found their pay hit hardest and that are the group that finding it most difficult to find decent housing, employment and are more likely to experience poverty. With the scrapping of the Educational Maintenance Allowance and the raising of university fees young working-class people are more in debt than ever before. In 2015 the Cambridge Centre for Housing and Research found that 83,000 young people had been accommodated by local authorities and homeless services in 2014. A shocking 8% of 16-24-year olds said that they had experienced homelessness and in London homelessness had risen by 40%. This is before government plans to scrap housing benefit for the 18-21-year olds had been implemented. There has also been a significant deterioration of young people’s mental health. 150,000 young people attended accident and emergency departments last year. It is estimated that one in 12 young people are thought to have injured themselves. Land transport accidents are the leading cause of death for young people between the ages of 5 and 19 with suicide being the second leading cause of death for males. Suicide and accidental poisoning is the leading cause of death for people between the age of 20 and 34. Many of these deaths are preventable but we don’t hear the same howls of outrage and calls for tough action as we do when young people die on our streets from a knife attack. It is by dealing with these underlining issues that we can begin to deal with the gang related problems our young people get lured into. The government needs to create apprenticeships that lead to real, well paid and secure jobs. The career, advice and community and youth centres that have been closed down need to be reopened with well trained staff and resources to operate effectively. The drug trade needs to be legalised to undermine the control of organised crime and to take away the stigmatisation of addiction so that those looking for some kind of respite from the pain of poverty can do so in controlled and safe conditions. The historic funding cuts made by governments must be reversed to enable Further Education colleges to meet the long-term needs of our communities. No young person should feel the need to take their own lives, kill another or look for solace in drugs. Society has the means to create the conditions that our young people can feel safe and secure and never know what it is like to hanker after something that numbs them from despair and powerlessness. The problem is with those who assume power over us and whose priorities lie elsewhere, and who are fearful of allowing young people the opportunities and conditions to be able to fully develop their own creative potential and ambitions.